The Myanmar Centre for Theological Studies (MCTS) is a training centre just outside Yangon, Myanmar. But this partnership is not just about theological training, it’s about empowering and equipping a generation of Christ followers and community leaders who live in one of the most difficult countries on earth. They are passionate about serving God, bringing hope to their own people and facilitating change in their communities. Most of the students are from hill tribes and their primary focus is to go to live alongside local people and initiate change. They train at MCTS from all over Myanmar. Some go on to further training, some go back to their own communities better equipped to serve those communities and others go into missionary action. It is this third group that this partnership is primarily about. 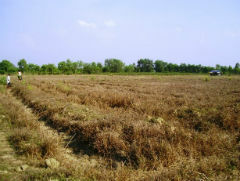 The vision is to establish an income generation activity (IGA) on some land nearby the MCTS campus. The plan is to develop a chicken broiler unit to generate profit. This profit would be used to subsidise some of the staff and students at MCTS and to support key change agents in the field. MCTS was founded by Dr Aung Mang in 1993 with 13 students and 5 faculty members at Pawh Kan, Insein Township, Yangon. It is an undergraduate training school. In 1997 MCTS moved to Hmawbi where the school is now situated. Up until 2010 they have trained 181 graduates who are now in full time ministries such as church planters and local missionaries, pastors, administrators, Bible teachers, donors, pre-school teachers, children ministries and taking care of orphanages in various places. Dr Mang is now the principal of the Myanmar Evangelical Graduate School of Theology (MEGST) but there is a competent staff running the operations at MCTS. They take in between 20 and 25 students per year in their three year degree program and have a faculty of 6 or 7 full time staff. In 2008 BHW and MCTS began exploring options based around pig raising, egg production, seasonal crop growing and raising chicken broilers. It became obvious quite quickly that pigs and egg production were not even close to profitable so seasonal crop production and raising chicken broilers were explored further. Around 20 acres of land has been purchased for the purpose of developing these. 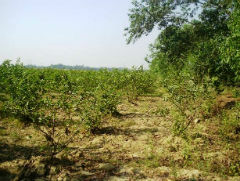 There are around 400 guava trees and the land is appropriate for rice growing. It’s on one of these blocks of land that the chicken broiler production unit will be developed. The primary purpose of this project is to generate profit to support the operating costs of MCTS and also the support and income generation of change agents so there will be numerous and various beneficiaries. We have been very impressed by the clear vision of these people, the good structures they have in place, and the high calibre of the alumni we have met and the current leadership. The key person is Dr Aung Mang. He is currently the principal of the Myanmar Evangelical Graduate School of Theology (MEGST). Khup Thang is part of the faculty of MCTS. The staff of MCTS have been designated to oversee the development of income generation and Khup is the key person in this. 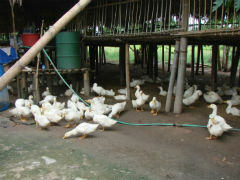 To develop a chicken broiler production unit to support MCTS operations and alumni church planters. There is a one-off amount of US$29,150 required to set this up. This will go towards the erection of appropriate buildings, purchase of essential equipment including a chinese tractor to produce food, the establishment of the first batches of chickens and to cover the first few months of the operations. This partnership has been financially supported by a family in the United States.